In six weeks, Ellese Carmona will don a cap and gown and bring her education at San Diego State University to a close. She will take her determination and intellectual curiosity to Harvard University, where she will begin a Ph.D. program for biological and biomedical sciences. If history is any guide, she will succeed in Boston as she has in San Diego, characterized by determination to seize a larger future afforded by the Compact for Success program. Her academic journey began in a lower-income community of Chula Vista in the Sweetwater Union High School District. As a 7th grader, she took her first steps in the Compact for Success Program, an SDSU-Sweetwater partnership designed to offer at-risk students guaranteed admission to the university. 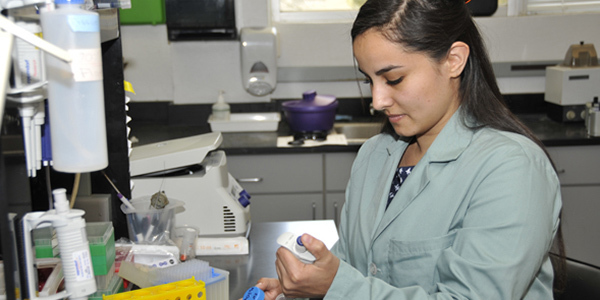 She will leave SDSU as an accomplished scientist and published researcher. As a first-generation college student, she knew the program was an opportunity she could not afford to take lightly. When she arrived at SDSU, fellow Compact Scholars directed Carmona toward programs and clubs that matched her interests. She came to discover a love of microbiology research. Professor Kelly Doran had an opening in her laboratory in 2009, which Carmona eagerly claimed. She also joined the Minority Access to Research Careers Program, and later learned of Harvard’s summer research internship— yet another opportunity Carmona has seized along her academic journey. The Compact Scholars Program nurtures academic and social success in students by connecting them to the rich resources of the San Diego State University campus community. Compact Scholars helps leaders get their start at SDSU.